Fun-filled 3-day workshop in beautiful Lake County! 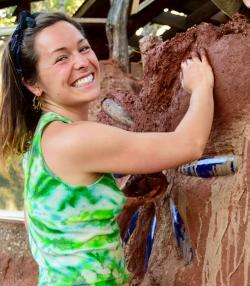 Come learn and play with us as we explore using earthen materials to create beautiful and vibrant colors on interior and exterior walls, and how to make structures out of pallets! THE PROJECT: Our Pallet House is a cute little dwelling designed by a high-end New York Architecture Firm and is an award-winning emergency shelter, just under 200 sq ft total. The unit is very functional, with space for small living and kitchen space, a small bathroom and a sleeping loft! Both front and rear entrances come with some outdoor living space as well. NOTE: not legally permitted as an occupied dwelling in Lake County. We will be putting our finishing touches and getting plenty of hands-on practice in mixing, coloring, and applying plasters, both lime and clay mixes. 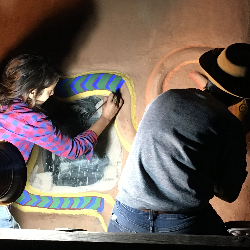 We will have the opportunity for artistic impressions while we learn how to mix paints with lime and earth base, about using natural pigments, and practice making art! Our Workshop leaders will be guiding us through the basic building concepts for temporary and permanent applications, and explain how this was put together for the farms herb-drying house. Our aim is to impart knowledge about utilizing materials from the waste stream and to promote building with natural, toxin-free materials to create a warm, cozy shelter. 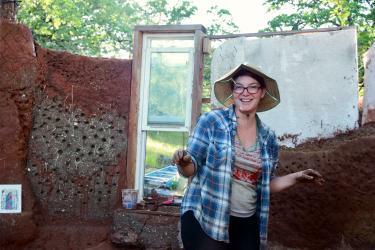 Special guest teacher and local awesome plaster expert RACHEL AVILLA will be showing us how to mix and apply Interior & Exterior earthen and lime plasters. 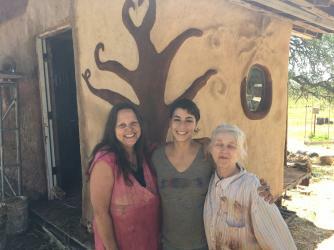 There will be a lecture on the pallet house build, as well as instruction and hands-on practice for making and applying cob over pallets by resident teacher Brenda Quintero. 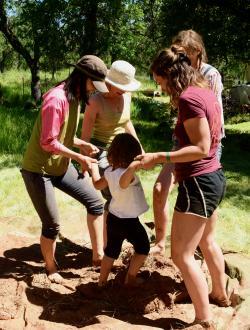 Cost for the full 3-day workshop is $275 and includes lunch daily and onsite camping at beautiful Golden Rocks Permaculture Farm located in Middletown, Lake County, CA. 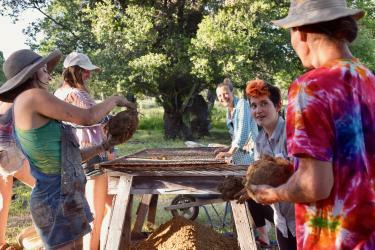 The workshop participants will enjoy a shared community kitchen space, access to outdoor shower and bath tub, nightly camp fires and plenty of song, fellowship and story-telling. Meals are always made with love and care, with many ingredients grown right hear on the farm! Upgrade to dorm room or camper is limited, so register early if you'd like an indoor spot! Families welcome! Attendees under age 18 must be accompanied by an adult. Group, family and senior discounts available. Inquire within for further information.